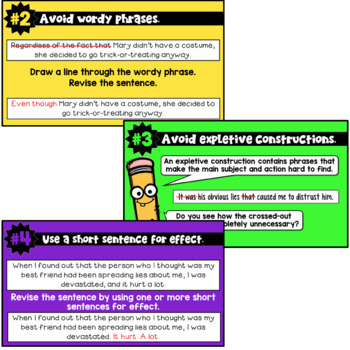 Are you looking for a writing lesson you can use to teach your students how to reduce wordy sentences? This PowerPoint lesson focuses on the importance of reducing sentences to make them more focused and easier for the reader to follow. This resource contains a 47-slide PowerPoint, a matching companion handout, two reference charts, and two worksheets that can be used to provide a follow-up practice opportunity. 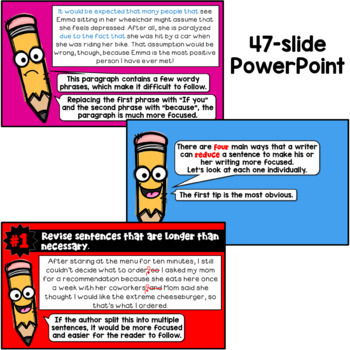 The worksheets contain 4 shorter paragraphs and one longer narrative passage that have sentences that can be reduced using the four techniques highlighted throughout the PowerPoint. 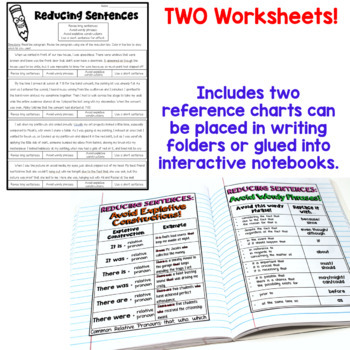 The reference charts are personal anchor charts that can be glued into an interactive notebook or tucked into a writing folder. One chart lists wordy phrases and their alternatives. The other chart lists examples of sentences with expletive constructions. 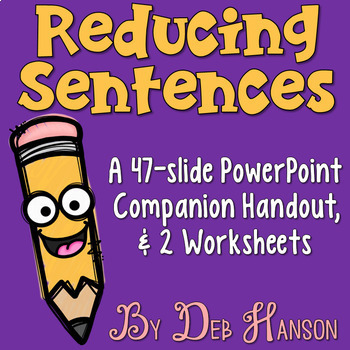 This resource is also included in my WRITING POWERPOINT BUNDLE. Feel free to take a peek at some of my related resources! Just click on the links below!